Lymph nodes are a part of the immune system. When enlarged, they are commonly referred to as “swollen glands.” Each side of the neck contains anywhere from 20-100 lymph nodes. 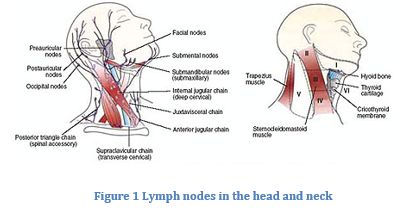 They are mapped out into six different levels in the neck as shown below on the right side of figure 1. Lymph nodes can become enlarged from a multitude of conditions that occur in the head and neck. This may be a response to infection, inflammation, or through spread of a malignant (cancerous) tumor. Lymph nodes may even develop into tumors of their own, called lymphoma. When a lymph node enlarges and there is suspicion of it being a tumor, a biopsy is indicated. A fine needle aspiration (FNA) biopsy can be done under local anesthesia. This will either be done in our office or at the hospital using an ultrasound to guide the needle placement. Other times, an FNA biopsy is inadequate to make an accurate diagnosis. In this case, a lymph node biopsy will be done in the operating room and the entire lymph node is removed. This operation is usually done under intravenous sedation or general anesthesia. A small incision is placed in the appropriate region of the neck. Your surgeon at Suburban Ear, Nose, and Throat will then remove the lymph node and send it to the pathology department for diagnosis. Results will usually be available in 2-3 days. This is generally an outpatient procedure.